The original version of Triple Chance was created years ago for land-based casinos by Merkur, the renowned German entertainment provider. 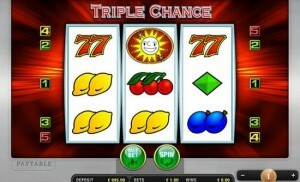 A classic Fruit Machine, Triple Chance is a basic slot, extremely easy to learn and play. One of Merkur’s all-time favorite, Triple Chance was among the first to become available online. The online game is based on the land based version, with nicer graphics and with additional features on the online version. Due to the popularity of the online version, Merkur has since launched Double Triple Chance, a later online version, with practically all the same features and gameplay. The only difference is in the Rewin bonus feature, which in the later version has been modified to offer players greater odds at wining a bigger jackpot! Like all Merkur slots, Triple Chance is available exclusively on Sumaker online casino. Triple Chance is a classic Fruit Machine slot. Symbols include the usual Cherries, Plums, Oranges and Lemons. Symbols other then fruits include 7s, Bells and Diamonds. 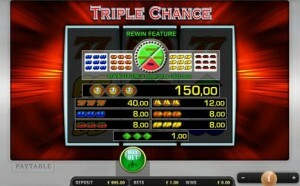 Both versions of Triple Chance are 3 reel 5 payline fruit machines and both follow the same basic gameplay. The aim of the game is to complete a combination of 3 same symbols appearing in succession from left to right across all 3 reels. There are no Wild or Scatter symbols in neither version of Triple Chance. Unlike many British fruit machines, Triple Chance doesn’t offer “Hold” or “Nudge” options, thus spin results cannot be manipulated by the player. However, the player’s skill does play a role in this slot, in playing the “Gamble Ladder” game (see below). Both versions include an Auto Start feature, which automatically plays the game for the selected number of spins. The game is played with fixed 5 paylines. The bet is per spin, and the player can adjust the bet per spin at any time. The betting range is between €0.05-€10.00 per spin. Maxbet automatically plays the game with the 5 fixed lines at the maximum bet level. The total bet per spin remains visible on the screen throughout the game. Gamble – in both versions, the Gamble option is activated randomly after a winning spin. Two buttons, “GambleLadder” and “Gamble Card” appear on the screen. The Player can then choose to click Gamble Card, for a chance to double his wining, by guessing the color of the next card drawn from a deck of cards. Players can continue playing the Gamble Card option, up to a limit of €140, or until a no-win gamble is hit. In the Gamble Card option, the player can choose to bet only half, or his entire winnings. Rewin – the Rewin feature is activated whenever 9 same symbols appear on the reels, feeling the whole screen with the same symbol. A wheel appears on the screen. In the Triple Chance version of the game, the Rewin wheel is divided into 4 sections, with a Stop sign appearing in one section and a “Mystery” sign in the other 3 sections. The wheel starts spinning. If it stops on the Stop sign, the Rewin game ends and the player wins nothing. If the wheel comes to rest on one of the other sections, depending on what lays behind the Mystery sign, the player can win double or nothing. The wheel will continue spinning so until a no win spin is hit. The Rewin feature in the Double Triple Chance version follows the same principles. The only difference is that the Wheel in the later version is divided into 6 sections, offering the player more chances to double his winnings. The Paytable shows the payout for each winning combination for the current bet level. Three Diamonds will fetch the maximum jackpot of €1,500 when playing at the maximum bet level. Triple Chance is not a progressive slot game. Overall it is a classic, easy to master, fruit machine. Both versions are recommended for beginners, with the Double Triple Chance version offering slightly higher chances to earn additional winnings.